Low magnitude high frequency (LMHF) loading has been shown to have an anabolic effect on trabecular bone in vivo. However, the precise mechanical signal imposed on the bone marrow cells by LMHF loading, which induces a cellular response, remains unclear. 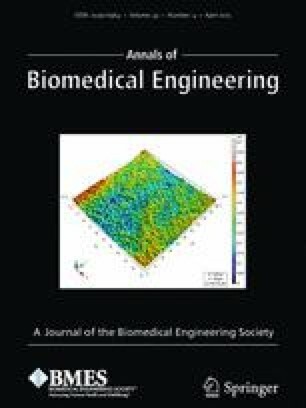 This study investigates the influence of LMHF loading, applied using a custom designed bioreactor, on bone adaptation in an explanted trabecular bone model, which isolated the bone and marrow. Bone adaptation was investigated by performing micro CT scans pre and post experimental LMHF loading, using image registration techniques. Computational fluids dynamic models were generated using the pre-experiment scans to characterise the mechanical stimuli imposed by the loading regime prior to adaptation. Results here demonstrate a significant increase in bone formation in the LMHF loaded group compared to static controls and media flow groups. The calculated shear stress in the marrow was between 0.575 and 0.7 Pa, which is within the range of stimuli known to induce osteogenesis by bone marrow mesenchymal stem cells in vitro. Interestingly, a correlation was found between the bone formation balance (bone formation/resorption), trabecular number, trabecular spacing, mineral resorption rate, bone resorption rate and mean shear stresses. The results of this study suggest that the magnitude of the shear stresses generated due to LMHF loading in the explanted bone cores has a contributory role in the formation of trabecular bone and improvement in bone architecture parameters. Associate Editor Ender A Finol oversaw the review of this article. The authors would like to acknowledge funding from the Irish Research Council, under the EMBARK program, U.S. National Science Foundation grant CMMI 1100207, Science Foundation Ireland under the Short Term Travel Fellowship and the ORS under the Collaborative Exchange Award. The authors would also like to acknowledge M.A. Varsanik for her assistance with the histology images.